Mahabir Jain was the ancient sage and the propagator of Jainism. 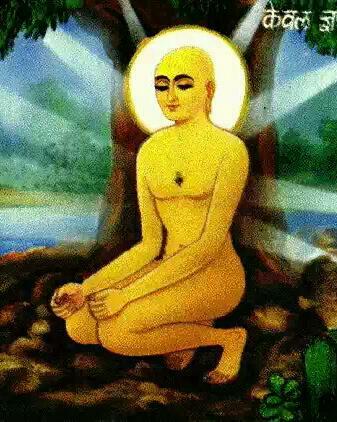 He was the twenty fourth and last Tirthankara (prohpet or guru) of jainism. Mahabir was born on 599 BCE.His earlier name was Bhardhaman Mahabir. His father was king siddhartha and his mother was queen Trishala. He married to Yashoda. He had a daughter Priyadarshana. At the age of 30, Mahavira gave up all his worldly things and left home to find the truth of life. He spent 12 years roaming the different part of the country. In this period he faced much difficulties.Some people even thought him as a thief and attacked him. He spent this years without any cloths and with little food. At the age of 43,near Jrimbhikgrama he attained the supreme knowledge (kaivalay). After attainment of kaivalay, he spent his time teaching others what he had learn.He added Brahmacharya (celibacy) with the previous teachings of jainism (non injury, non stealing, non possession). In 527 BCE near Patna,Mahavira died at age the of 72.